In this post, we have summarized for you the rules for the use of drones in Zambia. To fly a drone in Zambia, you need an RPAS Letter of Approval (RLA), a Certificate of Registration, and an RPAS Pilot’s License (RPL). All documents can be obtained from the Zambia Civil Aviation Authority. For me, Zambia is the prime example of over-regulation. Maximum altitude: In Zambia, your drone is allowed to fly a maximum of 120 meters. However, the drone must not fly higher than the highest object within a radius of 300 meters. Maximum horizontal distance and FPV: Drone flights must be operated in Zambia within sight. The maximum horizontal distance must not exceed 500 meters. Compulsory insurance: RPAS Operator Certificate (ROC) holders require drone insurance in Zambia. not more than 7 kilograms with a maximum kinetic energy of 15 kJ. Distance to airports: At airports, a distance of 10 kilometers has to be considered. Other safety distances: You must not fly your drone near nuclear power plants, prisons, police stations, crime scenes or major national facilities. People, public roads, and buildings must be 50 meters apart. No-fly zones: Public roads should not be used to launch and land drones. Operating Hours: Drone flights in Zambia are only allowed in daylight. Special legislation: Drones in Zambia must be provided with a fireproof license plate indicating their nationality and registration number. The badge must have a white background and be labeled with black letters. During a drone flight, you must always have a first aid kit and a fire extinguisher in the immediate vicinity. Commercial pilot regulations: Commercial drone pilots require a Remote Pilot License (RPL). To obtain an RPL, you must be at least 18 years old, have a medical report, have sufficient English language proficiency, and pass multiple exams. If you are looking for that, you should study the document linked below. 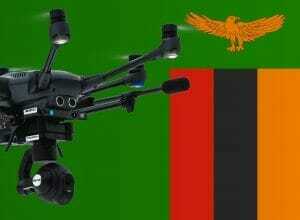 We have researched the listed drone regulations for Zambia to the best of our knowledge. We cannot guarantee the correctness of the information. If you want to be on the safe side, contact the competent aviation authority. Alternatively, you can also ask the embassy in your country for further information about the regulations. Please leave us a comment when you receive news and/or gain experience with your copter in Zambia! I am backpacking around Central and Southern Africa in a couple of months and had been told I couldn’t bring a drone in to Zambia even if I didn’t fly while I was there (per UAV Systems International). Did you have any issues when you went to Zambia with your drone? I am trying to avoid the dreaded leaving my drone in a locker in Zimbabwe while I visit Zambia. Any suggestions would be great. I haven’t been to Zambia, and most readers leave their drone at home when they travel to Zambia. Therefore, I can not give you a good advise. I am sorry! But let me know which experiences you will make! I am currently in Zambia now. I brought my DJI Spark with me without any issues! As stated in the post; Zambia is very strict regarding drone flying so you may not get much use of it..
With permission you could fly it in/over private property/land, but national spots requires very expensive permission. The penalty for flying without could be jail time and you will most likely loose your drone. Some people end up getting away with it by bribe, but its usually 2,000 dollars..
Hello Martin. Did you cross into Zambia overland or via airport? I am hoping to fly out of Zambia but am worried about getting it confiscated at the airport before flying out. In september i am going on vacation to Victoria Falls, Zimbabwe, Mozambique, Swaziland, and Pretoria South Africa a tour with the Songololo Expres (Train). Do you think that these are places to take my Mavic Pro with? Considering en respecting the laws over there, or beter not taking a drone to this countries? I’m doing a very similar trip in January, if you bring your drone could you please leave an update on how it went here? Thank you! I went to Zambia last October (landed in Lusaka). I took my Mavic Pro with me in my backpack. Customs didn’t see/say anything. I only used my drone on private property. We left via Livingstone airport. I have lived in Zambia since 2009. I would recommend to be careful, a single positive experience says nothing about what is going to happen to the next person. A friend had brought his drone and done some filming, even in town and there was no problem at all, but I heard about another guy who actually ended up in jail – though I have to admit I do not know the whole story in that case… If you have to argue with an officer always remain calm and friendly, never complain about the law or police, getting loud or aggressive will make things worse. Thank you for your essential tips. It helps a lot! Coming with a drone in Zambia is not a problem at all. The problem is not following law’s over drone’s.. You can come with it and can only fly it if you do what the Zambian laws want..its just the same as buying a car….you can not drive a car on Zambian roads if you haven’t done what’s right.